Chicago, Ill., March 13 1915. Byhalla Miss., Nov. 25th, 1914. 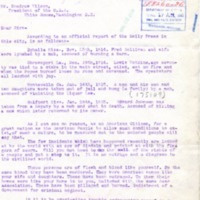 Fred Sullivan and wife were lynched by a mob, accused of burning a barn. Shreveport La., Dec. 18th, 1914. Lewis Watkins, age seventy was tied to a stake in the main street, oiled, set on fire, and when the ropes burned loose he rose and screamed. The spectators all laughed with joy. Montecello Ga. Jan. 14th, 1915. A man and his son and two daughters were taken out of jail and hung (a family) by a mob, accused of violating the Liquor Law. Gulfport Miss. Jan. 29th, 1915. Edward Johnson was taken from a Deputy by a mob and shot to death. Accused of killing a cow which later returned to its owner. The few incidents which have happened recently are looked at by the world with an eye of disdain and pointed at with the fingers of scorn. Will you not heed to the call of the rights of a people and put a stop to it. It is an outrage and a disgrace to the civilized world. These persons are of flesh and blood like yourself. By the same blood they have been murdered. They were American women like your wife and daughters. These have been outraged. To them their homes were like your home is to you, hallowed with the same dear association. These have been pillaged and burned. Indictment of a Government for criminal neglect. Is it to be everlasting trouble, endangering peace? Or, is there a possible solution of the vital issues between us? Today, Europe is sunken deep in war. The world bristles with guns. It is time for intelligent listening and clear thinking. Winston, J. B., “JB Winston to Wilson,” 1915 March 13, LO31315a-b, Race and Segregation Collection, Woodrow Wilson Presidential Library & Museum, Staunton, Virginia.